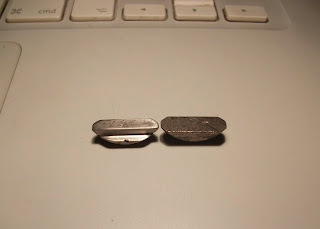 This is a quick & dirty way of altering the base ignition advance on magneto type ignitions. 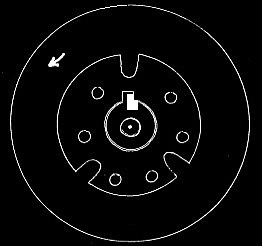 By milling the woodruff key, you will be able to reposition the flywheel to an advanced or retarded position, hence altering the base ignition advance. The proper way of cutting the flywheel key is with a milling machine, though a coping saw and/ or a jewellers precision file will do the job as well. In the below photo, there is an example of a modified woodruff key for a Tzr250 1KT motorcycle near a stock one. Remove as much material you need from the side of the woodruff key to advance the timing, Start with 0.1mm increments until you reach the desired ignition advance. Also, cut to a depth of 2.2mm (this measurements counts for most Yamaha 2stroke bikes) so you will ensure that the bottom face of the cutout is slightly below flush with the flywheel taper. Reassemble the flywheel key and advance the flywheel anticlockwise until the slot sits against the cutout face of the woodruff key. Positioning the flywheel key as in the photo will advance the base timing. Positioning the flywheel key in opposite will retard the base timing. Have fun and use at your own risk!